Hello. I'm Tom. I've just moved to Borth. I play Classical piano, Jazz and am a Songwriter. 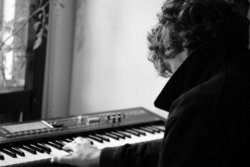 I teach Piano(Jazz and Classical), Songwriting and composition to all levels with an approach combining theory, technique and deep understanding of the music with intuition, improvisation and enjoyment. I have a holistic approach that effectively combines these qualities and believe that learning an instrument when approached healthily should be a great joy every step of the way. I charge 20(25 for home visits) pounds an hour. At the moment I am only able to offer home visits. I have been teaching pupils of all ages and an array of abilities for the last five years. Whilst being very knowledgeable from studying at a Specialist Music School and with some terrific teachers I have also taught myself Jazz and write and perform my own songs regularly. I combine an approach based on spontaneity, improvisation and exploration with a thorough understanding of approaches to the Piano- In particular I am influenced by Tobias Matthay, Alfred Cortot and Chopin's own teaching materials. I also have explored different methods of learning because of my own struggles at a younger age with technique and the physical side of playing. Timothy Galway's 'The Inner Game of Music' has been particularly influential. I combine knowledge of theory and serious study with creativity and improvisation and can find a mix to suit you. I take students through the ABRSM grades if they desire or let them learn and develop simply playing the music they love. If you have any questions don't hesitate to get in contact. TomFrom Catalina (5/5): Always on time, professional and makes music techniques fun and easy to learn for my 7yr old. Seeing the little one's enthusiasm for piano, he has kindly offered extra 15min at no extra cost. Highly recommended to anyone learning a new instrument from scratch - thanks Tom!